Where Beauty Bar attracts a crowd now was once the headquarters of the Italian Labor Center, at 231 East 14th Street. Built in 1919, when this corner of the East Village was a mini Little Italy, it also served as the home base of the Cloakmakers union. The old marble sign is still there, flanked by two interesting bas reliefs that seem to oppose each other. The carving on the right depicts a man (a worker, with a shovel), woman, and baby seemingly content with no drama. On the left, however, the woman is suckling a snake, her hair electrified and her face contorted in pain. Her child is scrambling from her in terror. Her husband is in the background, hard at work digging or plowing, oblivious to the turmoil. 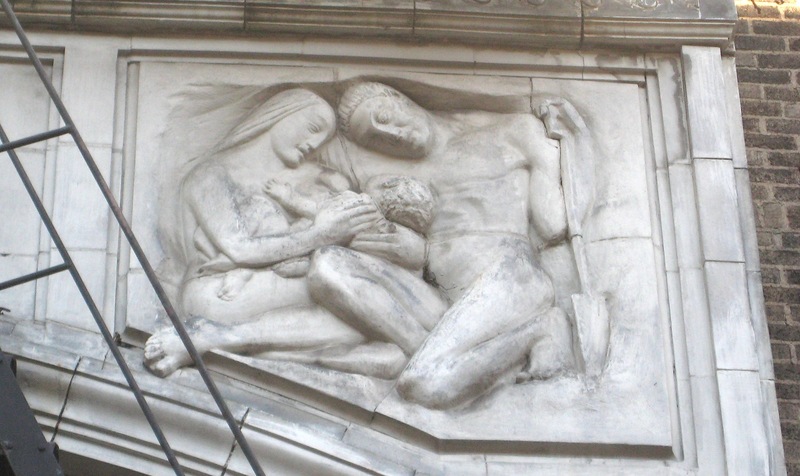 “The carvings are probably the work of Onorio Ruotolo, poet and sculptor, whose works in that period dealt with the theme of workers and their resistance to exploitation,” states The Lost World of Italian American Radicalism. This entry was posted on November 29, 2010 at 3:15 am and is filed under Bars and restaurants, Cool building names, East Village, Politics, Random signage. You can follow any responses to this entry through the RSS 2.0 feed. You can leave a response, or trackback from your own site. 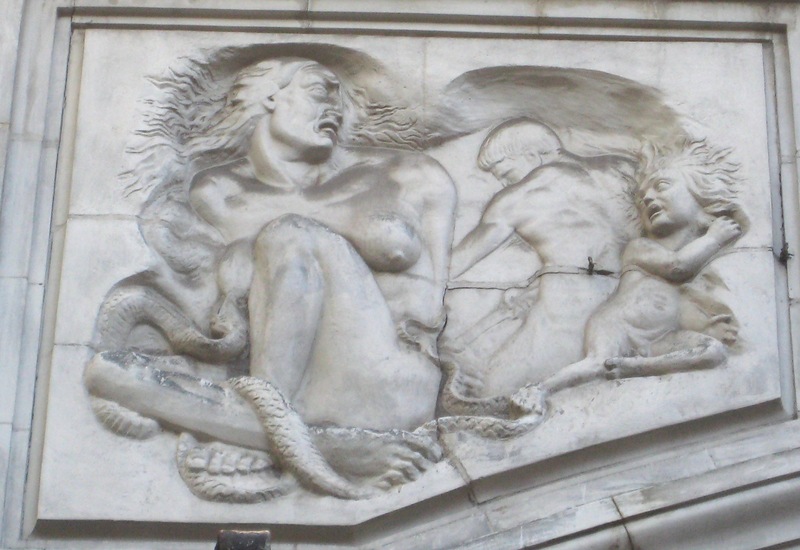 The woman w/ serpent & man toiling & crying baby depict Eve & the Serpent (Satan) & Adam & humanity (suffering offspring of Adam & Eve) after ‘The Fall’ (eating the forbidden fruit of the Tree of Knowledge & being cast out of Eden). Adam (& every male offspring) is believed destined to a life of ‘labour’ after The Fall — hence this bas relief on this particular building. (As presumably the Italians who carved this were Catholic).